Of all the holiday décor, St. Patrick’s Day is the biggest challenge…at least for me! Hopefully, there are some of you who can relate! Since my personal crafting style leans toward contemporary, colorful with a slight dash of sophistication – St. Paddy’s Day can really give me a run for my money. I try to avoid leprechauns or clover-overload (cloverload? Lol!). Green beer tastes delicious but I don’t want it as part of my home décor. So what does that leave you with? Well, friends – I finally figured out a few easy crafts that will bring St. Paddy’s Day in but like the kitsch outside. 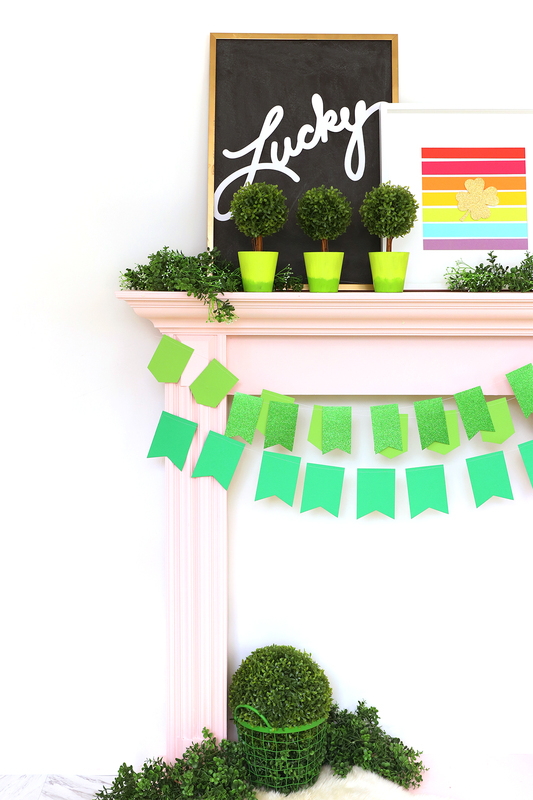 This simple, modern St. Patrick’s Day mantel brings together a few of my favorite basic JOANN supplies along with their new Hand Picked collection of spring accessories and décor. Let’s take a closer look at the elements I created for this mantel. It is my opinion that every St. Patrick’s Day display should have a rainbow in attendance. It doesn’t have to be a literal rainbow with a black cauldron filled with gold at the end. You can get creative with your rainbow – just like I did! The paper crafting section of JOANN is filled with colorful 12×12 scrapbook paper that is a great basic for your stash. I selected a bold rainbow spectrum to create a simple stripey framed piece for my mantel. Use the paper trimmer to create 1.5” wide strips. Then, use your Cricut Explore or Cricut Maker to cut a shamrock shape from the gold glitter paper. You can also cut this out with scissors if you don’t own a Cricut machine. Last, use the tape runner to adhere the strips together onto a sheet of white 12×12 cardstock. Then, use foam adhesive squares to adhere the gold shamrock. Now your simple artwork is ready for a frame! For another portion of my mantel, I created a trio of topiary trees. The trees are part of the Hand Picked collection at JOANN – and with a bit of ombre paint, they are perfect for a modern interpretation of St. Patrick’s Day. This simple, yet striking mantel décor definitely says “St. Paddy’s” without screaming it in your face. That’s exactly what I was going for and I hope you’re inspired to bring a bit of modern to your own St. Patrick’s Day decorations!